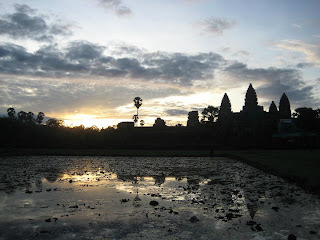 So, we arrived in Siem Reap after a grueling 14-hour bus ride. After settling in our Cambodian tropical heaven, the Pavillon D' Orient, we went out to grab a late dinner in some forgettable place then went back to sleep since we would greet the dawn at Angkor Wat, which tourists and locals claim to be the best time to view the grandeur of the temple. We're all in with this plan. After all, there is nothing more romantic or awe-inspiring as watching the sun rise above the ruins of a majestic temple. Oh, and there's the fact that we can beat the tourist crowd and get good photo ops. So, come the following day, we were up bright (although the clouds outside were still a dark gray) and very early (4:00 AM to be exact). 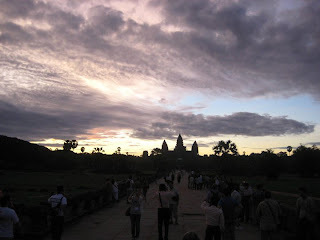 Come 5:00 AM, we were already on our tuktuk, enjoying the early morning breeze as we ride off to the Angkor Wat complex. The Angkor Wat and other temples such as Ta Prohm (of "Lara Croft: Tomb Raider" fame) and Bayon are all located in the Angkor Archeological Park. At the main entrance, you have to purchase an admission pass for 1-day (US $20), 3-days (US $40), or 7-days (US$ 60). The admission pass will serve as your entry. Very much like a visa, your picture will be taken and printed on the admission pass. You have to carry it with you at all times. Although it is not checked in each and every temple, better to be safe than sorry as the penalty is a whopping US $100 for the 1-day pass. Securing the admission pass is quick and painless since the process is simple and straightforward and there are a lot of booths to accommodate the influx of tourists. Plus, we went there extremely early. Apparently, all the guide books probably say the same thing -- to watch the sun rise over the Angkor Wat -- since there are a lot of tourists milling about the area already. Do not be disheartened though. The tourists are still quite a handful when compared to the size of Angkor Wat (at 1 square kilometer, not including the river canal surrounding it on all sides) so there's plenty of photo op spots for everyone. The best vantage point is at the edge of the moat -- the VIP seat to one of the most spectacular sunrises you'll ever see. Ah, Cynthia! I want to see Angkot Wat, too. I'll ask tips from you when I decide to go :) Did you take photos using your lomo? Surely, Ate Mice. Just let me know. Sorry, i just saw your message now. Thank you for the compliment! And, yes, you may use this idea for your blog. Actually, I was also inspired by another blog called The 30 before 30 project.